Regardless of whether your playground is intended for commercial or home use, your setup is incomplete without a swing. Commercial swings have tougher regulations and a stricter range of motion, but backyard swing sets rarely reach the same towering heights. So how do you choose between the two? Let this page be your guide. The first question to ask yourself before constructing a swing set is who do you expect will use it? If you’re simply providing activities for your own children, then a backyard swing set could suffice. However, if you expect children in your community to regularly use this equipment, residential playground can’t guarantee their safety with the same authority. Commercial swingsets are built in compliance with CPSC guidelines because they are intended for just that purpose; children of all shapes and sizes will be using this equipment, and sometimes without ideal levels of supervision. What are Your Design Standards? Educating yourself on the design regulations for both commercial and residential structures is the best way to decide which kind of swing set suits your needs. A backyard swing set can have three and more swings connected to a single support structure, alongside slides and climbers. This kind of design is spatially economic for a backyard setting, but violates the use zone standards for commercial or public use. As a rule, commercial swing sets must be isolated to their own structures. Play sets with platforms, slides, and climbers must be constructed at a fixed distance from any active commercial swingset. Commercial swing sets are typically suspended with galvanized steel chain and safety hardware. 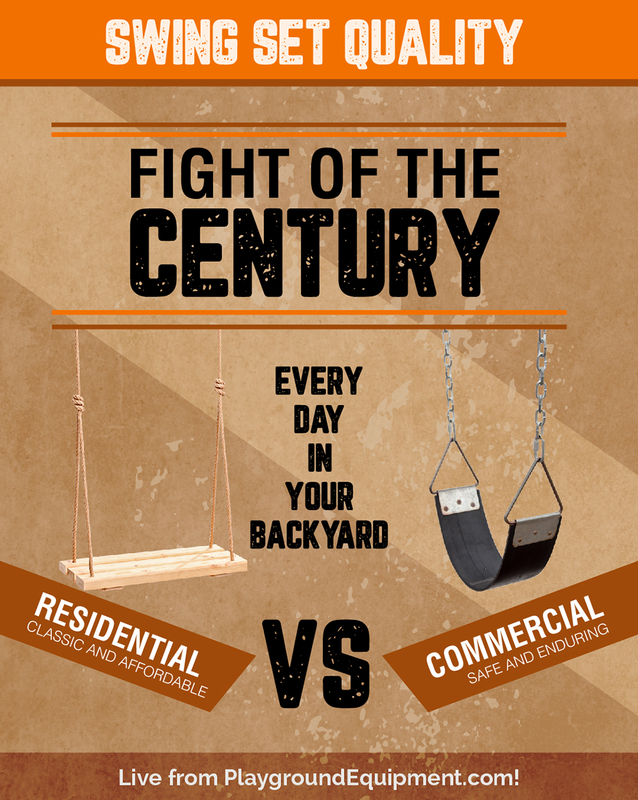 In your backyard, swing sets can be tethered by a regular steel chain and sometimes even rope. In the confines of your own backyard, you can even tie your swing to a tree branch the old fashioned way. Ultimately, while a backyard swing set offers more freedom in design, it cannot compete with the quality standards of a commercial-grade playground structure. In terms of safety and reliability, commercial swing sets are the obvious choice. This is, however, one more pressing question to be asked. Playground equipment varies in more than just aesthetics. When comparing an arch post swing to a single post swing, the price difference can be hundreds of dollars. Most agree that arch posts are more aesthetically pleasing than other swings, thus a more desired design but both structures offer the same support and durability. When you decide which swing structure you will purchase, take into account the space and design, as well as budget. These aren’t questions you need to answer on your own. PlaygroundEquipment.com is here to help. Don’t hesitate to contact us with any questions you might have with regards to safety, design, or financial concerns. We’re highly qualified in all of those topics. Shop for playground swings and accessories online.